The social tensions leading to the English Civil War were reflected in English fashion, with the elaborate French styles popular at the courts of James I and his son Charles I contrasting with the sober styles in sadd colours favoured by Puritans and exported to the early settlements of New England (see below). Bodices were long-waisted at the beginning of the century, but waistlines rose steadily to the mid-1630s before beginning to drop again. In the second decade of the 17th century, short tabs developed attached to the bottom of the bodice covering the bum-roll which supported the skirts. These tabs grew longer during the 1620s and were worn with a stomacher which filled the gap between the two front edges of the bodice. By 1640, the long tabs had almost disappeared and a longer, smoother figure became fashionable: The waist returned to normal height at the back and sides with a low point at the front. Hilliard's Unknown Woman of 1602 wears typical Puritan fashion of the early years of the century. Her tall black felt hat with a rounded crown is called a capotain and is worn over a linen cap. She wears a black dress and a white stomacher over a chemise with blackwork embroidery trim; her neckline is filled in with a linen partlet. Marie-Louise de Tassis wears a short-waisted gown with a sash over a tabbed bodice with a long stomacher and matching petticoat and virago sleeves, c. 1629–30. Linen shirts had deep cuffs. Shirt sleeves became fuller throughout the period. To the 1620s, a collar wired to stick out horizontally, called a whisk, was popular. Other styles included an unstarched ruff-like collar and, later, a rectangular falling band lying on the shoulders. Pointed Van Dyke beards, named after the painter Anthony van Dyck, were fashionable, and men often grew a large, wide moustache, as well. Doublets were pointed and fitted close to the body, with tight sleeves, to about 1615. Gradually waistlines rose and sleeves became fuller, and both body and upper sleeves might be slashed to show the shirt beneath. By 1640, doublets were full and unfitted, and might be open at the front below the high waist to show the shirt. James VI and I, 1603–1610, wears a satin doublet, wired whisk, short cape, and hose over cannions. Narrow points are tied in bows at his waist. He wears the garter and collar of the Order of the Garter. Philip IV of Spain in military dress, 1644, wears a broad linen collar and matching cuffs. His sleeved short gown or cassock of red with metallic embroidery is worn over a buff jerkin and silver-gray sleeves. He carries a broad-brimmed black hat cocked on one side. 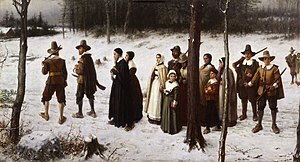 Contrary to popular belief, most Puritans and Calvinists did not wear black for everyday, especially in England, Scotland and colonial America. Black dye was expensive, faded quickly and black clothing was reserved for the most formal occasions (including having one's portrait painted), for elders in a community and for those of higher rank. Richer puritans, like their Dutch Calvinist contemporaries, probably did wear it often but in silk, often patterned. Typical colours for most were brown, murrey (mulberry, a brownish-maroon), dull greens and tawny colours. Wool and linen were preferred over silks and satins, though Puritan women of rank wore modest amounts of lace and embroidery as appropriate to their station, believing that the various ranks of society were divinely ordained and should be reflected even in the most modest dress. William Perkins wrote "...that apparel is necessary for Scholar, the Tradesman, the Countryman, the Gentleman; which serveth not only to defend their bodies from cold, but which belongs also to the place, degree, calling, and condition of them all" (Cases of Conscience, 1616). Berry, Robin L. (2004). Reticella: a walk through the beginnings of Lace (PDF). Archived from the original (PDF) on 14 June 2009. Retrieved 10 June 2009. Gordenker, Emilie E.S. (2001). Van Dyck and the Representation of Dress in Seventeenth-Century Portraiture. Brepols. ISBN 2-503-50880-4. Kliot, Jules and; Kliot, Kaethe (1994). The Needle-Made Lace of Reticella. Berkeley, CA: Lacis Publications. ISBN 0-916896-57-9. Kõhler, Carl (1963) . A History of Costume (reprint from Harrap translation from the German ed.). Dover Publications. ISBN 0-486-21030-8. Lefébure, Ernest (1888). Cole, Alan S., ed. Embroidery and Lace: Their Manufacture and History from the Remotest Antiquity to the Present Day. London: H. Grevel and Co. – via Online Books. Montupet, Janine; Schoeller, Ghislaine; Fouriscot, Mike (1990). Lace: The Elegant Web. New York: H.N. Abrams. ISBN 0-8109-3553-8. Ribeiro, Aileen (2005). Fashion and Fiction: Dress in Art and Literature in Stuart England. Yale. ISBN 0-300-10999-7. Scarisbrick, Diana (1995). Tudor and Jacobean Jewellery. London: Tate Publishing. ISBN 1-85437-158-4. Winkel, Marieke de (2007). "The 'Portrayal' of Clothing in the Golden Age". In Ekkart, Rudi; Buvelot, Quentin. Dutch Portraits, The Age of Rembrandt and Frans Hals, Mauritshuis/National Gallery/Waanders. Zwolle. pp. 64–73. ISBN 978-1-85709-362-9. Ashelford, Jane (1996). The Art of Dress: Clothing and Society 1500–1914. Abrams. ISBN 0-8109-6317-5. Arnold, Janet (1986) . Patterns of Fashion: the cut and construction of clothes for men and women 1560–1620 (Revised ed.). Macmillan. ISBN 0-89676-083-9. This page was last edited on 13 February 2019, at 07:44 (UTC).